On 23 August, ISIS claimed an attack on the Kaam checkpoint 20 km east of Khoms. Six members of the GNA-affiliated Special Operations Force were killed. The attack was reportedly conducted by three men, one of whom was killed, using automatic rifles and PRGs. On 11 May, the Presidential Council (PC) in Tripoli announced a decree that would significantly expand the powers of the Special Deterrent Forces (Rada). The GNA’s MoI established a new force called the ‘Special Operations Force’ (SOF). 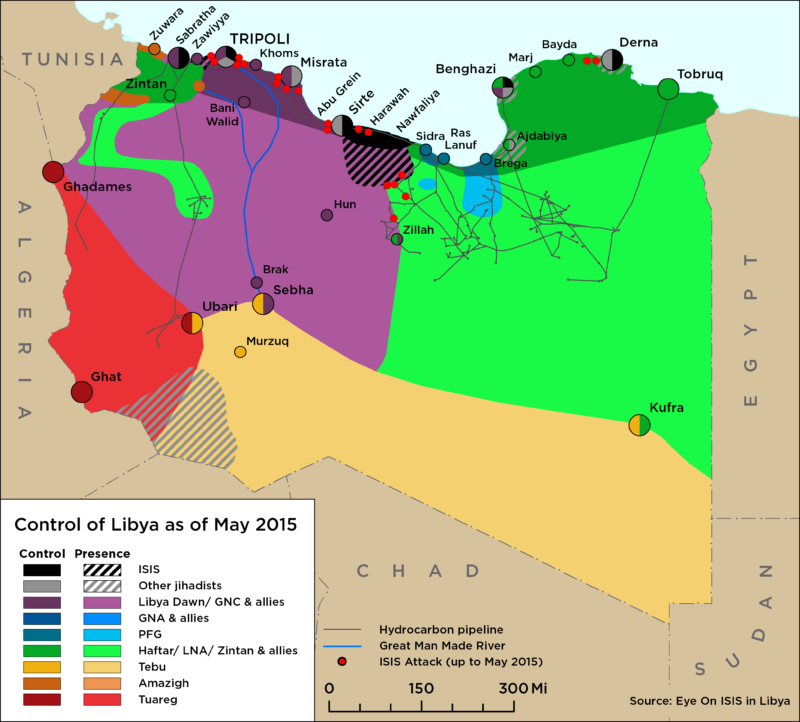 On 11 May, the Libyan Air Force had conducted strikes on fuel smugglers sites on the Libyan-Tunisian border. On 12 May, Tebu fighters managed to advance and take control of vital locations in south Sebha from their rivals the Awlad Suliman. On 29 March, ISIS undertook a suicide vehicle-borne improvised explosive device (SVBIED) attack on the southern entrance to Ajdabiya killing 5 people, wounding 6 and damaging at least 6 vehicles. On 2 April, Presidential Council (PC) spokesperson Mohammed al-Sallack announced the launch of a new military operation dubbed Asifat al-Wattan (The Nation’s Storm) with the aim of ending ISIS’s militant presence in Libya. On 20 November, the HoR voted to approve the proposed amendments to the 2015 Libyan Political Agreement (LPA). On 23 November, the HCS President Swehli issued a statement rejecting the HoR vote. On 27 November, UN Envoy Salame began a whirlwind tour of Libya visiting Tripoli, Misrata and he plans to visit Benghazi on 29 November. On 26 October, 36 handcuffed bodies were discovered in mass grave 50km south west of Benghazi. They seem to have been executed in the style attributed to LNA field commander Mahmoud al-Werfalli. On 26 October, Misratan security detained three alleged jihadists in Souq al-Khamis, east of Khoms. Clashes were reported in Zliten between forces said to be from Misrata and local Islamist fighters. On 17 September, the LNA broadcast the televised ‘confessions’ of Ibrahim Muftah Abu Nuwwara, an imprisoned Ansar al-Sharia fighter from Ajdabiya, in which he confessed to ordering assassinations in Ajdabiya. This sparked reprisals with the houses of those involved, namely the Jadhran and Abu Nuwwara families, being burned down. A team of Italian military and security advisors visited Sirte’s al-Qardabiyah airport to assess ‘reconstruction.’ The International Criminal Court (ICC) issued an arrest warrant for LNA’s Mahmoud Mustafa Busayf al-Werfalli. There are reports that an armed security contingent for the UN is planned to offload in Khoms port. 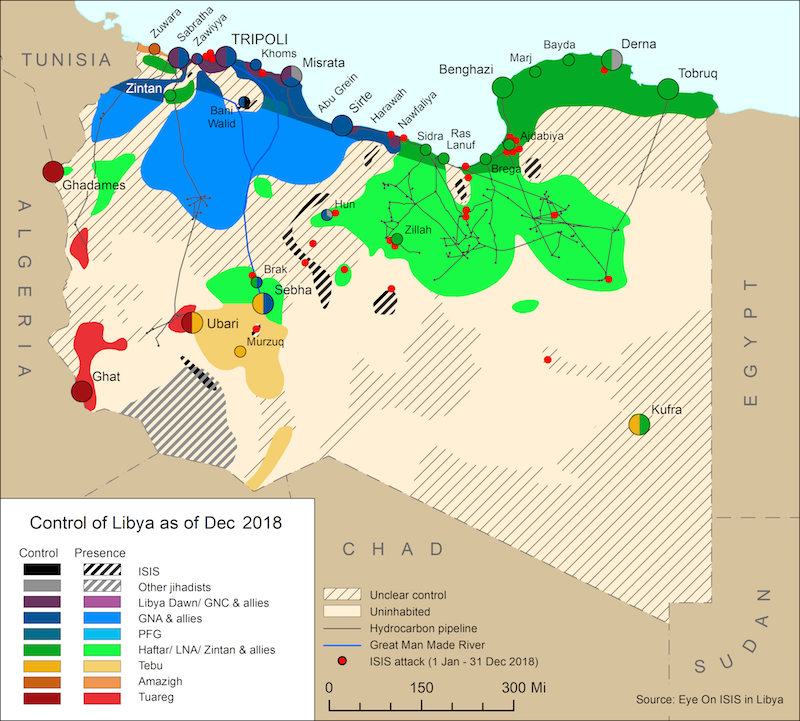 On 13 March, the LNA launched a major offensive to take control of the 12 Flats area of Ganfuda in Benghazi, while the head of AFRICOM has warned that ISIS are regrouping in Libya. ISIS fighters attacked the main control station of the Man Made River pipe system southern Libya, however the LNA says the fighters have been driven away and that they now have control of the station. In Khoms, the mayor says last month’s beheading was not carried out by ISIS. The beheading of a family in Khoms indicates ISIS fighters may have infiltrated the city, although the perpetrators of the attack are unknown. In Sirte, house-to-house fighting is taking place in the remaining few buildings where ISIS fighters are based, although BM forces continue to suffer losses. In Sirte, the Misratan-led Bunyan al-Marsus forces have continued to make gains against the remaining ISIS forces, which are now holed up in a very small section of the city. However, progress is slow because the Misratans continue to suffer losses from sniper fire and suicide attacks.